Today, more than ever, business collaboration relies on the effective coordination of many parties – both internal and external – to your organization. Here at ProLink Solutions, we have been wrestling with how to effectively incorporate enterprise task management into our existing document and business collaboration platform – Procorem. In working with our clients over the past few years, we have learned a great deal about business processes in the real estate, affordable housing, engineering, finance and corporate sectors. These conversations have helped us fully understand the gap in current project management tools on the market. Based on feedback provided by these clients, we are excited to announce our latest product release: Enterprise Task Management. Whew -that is a lot to say, but then again this is a major release! With Procorem’s Enterprise Task Management the power to control all aspects of your project – team collaboration, project management, approval workflows, and auditability of key project decisions – can now be fully managed in a single platform. The days of managing projects via email, through multiple excel spreadsheets, coordinating a variety of calendars and over-dependence on conference calls to keep everyone on the same page are long gone. With Procorem all of your project management activities are coordinated in a single system – so your team can get back to work! First log into Procorem and navigate to the WorkCenter of your choice. Tasks are managed directly within the WorkCenter under the tasks tab. Once in the WorkCenter, select the “Create New Task” button to begin creating a new task. The only information required to create a task is a Task Title, but below that is where the power begins! Task Groups – To Group your tasks simply type in your group name, or select from existing groups names. This is very helpful to organize your project tasks into milestone stages. Tasks can also be grouped by Assignee, Task Status, and Due Date. Description – Share with your group the core details of this task. Location – Easily add a location or conference number here if applicable. Start Date and Due Date – For basic tasks simply select the date when the task is due. For meetings and tasks with time duration add a start date for more information. Assigned To – In this section you can select the assignees for the task. Select from any contributors on the WorkCenter, choose district groups of users and decide whether all assignees need to finish the tasks individually or if one can finish for the entire group. Approvals – Much like the “Assigned To” section, with approvals you can select individuals or groups of individuals to act as approvers to complete the tasks. Control if all approvers need to mark the task as approved or if one person can approve for the entire group. You can also control if the approvals should be performed in a particular order. 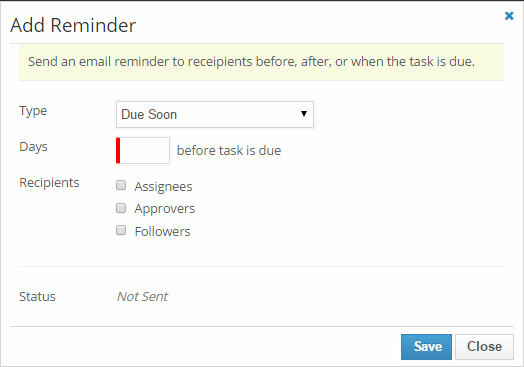 Followers – Select any number of followers on the WorkCenter to get email updates when the task is completed, approved, overdue and more. Sort Order – With sort ordering you can select the order in which your tasks can be performed. You can also use due date to control this action. Task Flow – With Procorem Task Flow you can set notifications based on the completion of previous tasks. Upon completion of the selected task in Task Flow, the assignees of the current task will be notified to begin work. When you are done with your task, don’t forget to save the task so it is entered into the system completely. Once you have created your task, you can easily create a variety of reminders to make sure your team stays on top of all of their tasks. To set reminders, select the task then navigate to the Reminders tab. From there you can add a variety of task reminders – based on whether the task is due soon, due now, or past due. Keeping an auditable history of all the activity around a task ensures that there is no debate in terms of when tasks were finished by assignees, approved and completed. Keep track of all critical task decision points in the activity section of the task. Once you are back in the primary task section, you will see all your saved tasks. Here you can easily group by Task Group, Task Status, Assignee, or Due Date. For those of you managing multiple projects at once, the “My Tasks” section has been improved to allow you to see all your tasks by role and timeframe for all the projects you are involved. Easily sort by whether you are an assignee, approver or follower of the task. Account Administrators have access to see all WorkCenters on the account, control critical settings, manage people and permissions, and much more. In Procorem, think of Account Administrators as the Project Manager. With this latest release, we have improved how Account Administrators, and those with appropriate WorkCenter Roles, can manage tasks across all WorkCenters (Projects) in an account. To manage tasks across an entire account, navigate to the account screen. Once there, select “Account Tasks” on the right hand side of the screen. Once in account tasks you can quickly filter by all users on the account, sort by their relation to the task as well as filter columns to sort all the tasks quickly and easily. Sort by WorkCenter, Task Title, Status, Due Date, Assignees and Approvers right in the Account Task Screen. As always, with a new release we value your feedback in improving the functionality to closely align with your business. If you ever have any questions or would like a little more guidance on how Procorem’s Enterprise Task Management can support your business, don’t hesitate to reach out to us at products@www.procorem.com, by phone at 303-663-5900 or as always, by commenting below. Good luck and happy project managing!